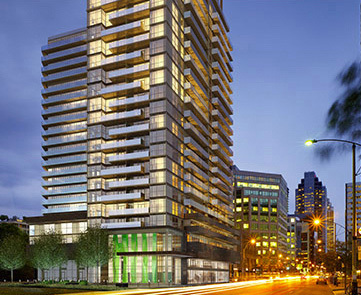 Fly Condos believes downtown living can give you wings. Located at Front and Spadina, steps from the Rogers Centre and King West's fine dining, theatre, and hot nightlife, Fly glitters with urban potential, from its modern-art-filled lobby to its rooftop lounge with cabanas and full al fresco dining table. Overlooking Clarence Square Park, Fly is just minutes from the lakeshore, the Financial District, and attractions such as the Air Canada Centre, CN Tower, TIFF Bell Lightbox, Princess of Wales and Royal Alex Theatres, and more.